Flotsam, Jetsam, and Pearls Beyond Price! You’ve explored the Western Ocean from Barsella to Terminus Island, but you’ll never truly experience it until you raise the Jolly Roger and strand law at the shore. Come join the ranks of pirates plying the shipping lanes, and make your own rules out on the high seas. Plunder this sea-chest of ideas to fuel your own high seas adventures. Pick up your copy of Pirates of the Western Ocean, and set sail for riches! Pirates have always had a fascination for role-players, so it's pretty much inevitable that some were going to turn up... The Introduction, however, takes a historical tack, starting with Viking raiders and going on to consider Barbary pirates of the Mediterranean as well as the Caribbean ones most often thought of when considering pirates for a fantasy role-playing game. It also introduces the historical concept of the privateer, a pirate licensed by his own government to wage proxy war on the ships of opposing nations. This provides a wide canvas, a range of suggestions beyond the norm on which to introduce pirates into your game. We start in Chapter 1: Lords of the Seas with copious details (including full stat blocks) of five notorious pirates encountered in the Western Ocean of the Midgard Campaign Setting. (If your game is set elsewhere, just tweak names and details to fit your needs.) This is followed by Chapter 2: Faces of the Western Ocean, which presents other NPCs who ply the sea lanes of the Western Ocean whom you can use as enemies or allies, chance encounters or just a passing rumour heard in a tavern. Ideas for how to incorporate them into your plots are included as well as standard details of stat block, background, combat information and portraits. One stand-out is Czakthorash, a green dragon who was the runt of his litter and devised a cunning plan: outclassed by his siblings in regular dragon methods of amassing a hoard, he's established himself as a 'cargo-cult' deity providing trinkets to primitive islanders in return for adulation... and plenty gems and gold as well! Next up is Palau Kelaparan, Home of Mechuiti and the Behtu. This presents an entire island located in a remote corner of the Western Ocean (or someplace suitable in your campaign world), the residence of Mechuiti (who is a demon) and his cohorts as well as the natives: the pygmy Behtu, who have some unpleasant habits. Explore the place if you dare, defeat the inhabitants if you can... This section includes some ideas for ways of getting your party to go there in the first place. Then comes Umbrasca, another island with a long and dark history. Again the geography is outlined, with locations to explore, and notable inhabitants to meet, along with plot suggestions for how to incorporate it into your game. If neither of these appeal, the next section presents several Lesser Ports of Call which a ship-borne party may care to visit during their travels... and if they are getting too complacent, call upon the inhabitants of the following section Pirate Bands to provide some opposition. These are provided in outline only, you'll have to put in some work before they are ready for a brawl on the high seas. We then move on to a Bestiary of the Waves, containing cannibal pygmies and rum gremlins, and notes on rules pertaining to being adrift at sea deigned to enable you to generate an encounter with someone cast adrift at short notice. Next is a section on Ships and Cargo, which provides loads of detail such as ship templates to aid in devising the ships your party sails in or encounters... but despite the heading, nothing much about cargo. This is followed by Mariner Magic and Culture. Here we find some new spells with a nautical flavour... and others, including some rather cunning temporal ones. There are also some magic items and mariner traits, for characters who spend plenty of time afloat. Finally, there are some Secrets of the Western Ocean... dark secrets for the GM to know and craft plots around ready to ensnare unwary parties and give them the thrill of discovery as they unravel the mysteries. These are based around aboleths and sea titans, who both once held sway in the depths but whose influence has waned, although it has not faded away completely. At the end there's a map of the Western Ocean, a rather disappointing one as it doesn't show any of the places mentioned in the text! There's plenty to spark the imagination if you want to bring pirates into your game - particularly if they will be attacking your party rather than the characters actually taking to a life of swashing their buckles pirate-style themselves. It could have done with more maps, the single one provided is virtually useless, but there are some good ideas here, although most will need further work before they are ready to be included in your game. 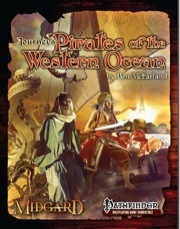 Pirates of the Western Ocean is a sourcebook / companion to Journeys to the West. 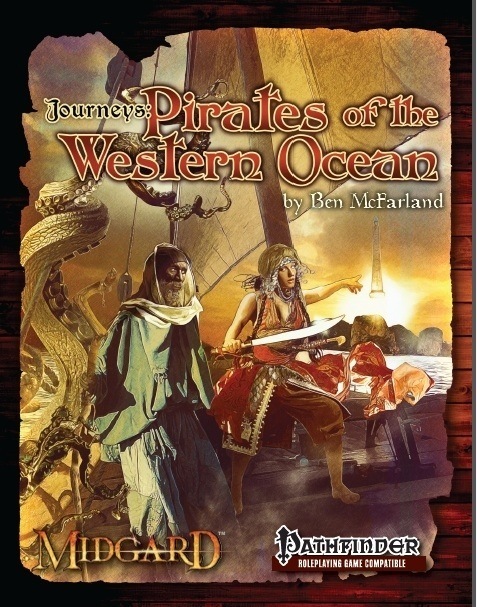 While that book focused on locations and adventure, this is a toolkit of people, magic, and things to place within, but easily mined to spice up any seafaring campaign (as I did heavily with the stats and personalities of many pirates within when I ran the Skull & Shackles Adventure Path). The first section gives you full realized prate NPCs to use, each with personality, goals and motivations. Many are human and would make great captains (all fairly high level) and some monstrous ones too which was a great surprise. The stat work was creative and clean and made full use of the PRD. The second two chapters are locations, including two islands with NO maps. The poor maps were a concern of mine in Journeys to the West but to not have any here is just plain weird. Something else, the two islands have good ideas but the writing isn’t particular descriptive or entertaining. The next two sections have pirate bands detailed and then a bestiary full of monsters. I liked these, easy to grab and use in your game. Very imaginative beasties. The section of spells and magic items was a mix. While I really got a kick out of the magic items, the spells were either confusing or seemed uninspired (including one I must have reread 4 times and still don’t understand). The wording on many didn’t seem complete or comprehensive. The next section is aboleth glyphs, a great alternate use of magical secrets I really thought showed great design. I used a few of these to propel plots in the game I ran to great effect. It end with a 2-page map spread of ‘the western ocean’, one which is all just water (I suppose those tiny black dots might be islands, I can’t tell and they are not marked) and the other the coast of the mainland (part of the Midgard campaign setting). Not a bad book at all. Most of it is very well done and useful. Apart from the island writing and lack of any maps and the strange spells, I got plenty of good mileage out of this book as a GM. This companion-tome to the Kobold Press-project "Journeys to the West" is 48 pages long, 1 page front cover, 1 page editorial, 1 page introduction/ToC, 1 page SRD and 1 page back cover, leaving us with 43 pages of content, so let's check this out! The pdf kicks off with memorable NPCs to add to your campaign, for example Ernst "Goldtooth" Galway (Rogue[Pirate] 13), who hides a grim secret, Evain "Sea-Bellows" Saol, a Sea Singer and his druidess gnome wife Ré Saol - pirates that actually can be considered a reliable good guy. Or take Keng Hakon, archivist/oracle from Kathay, whose massive flotilla still scours the seas. And Rushara the raven, the mysterious mistress of the "Seastrider" is looking for gold, yes, but also for memories...and not her own. Beyond these mid-level famous rapscallions, we also get a selection of more low-level individuals, though that does not mean that they are less interesting - The Oracle called "The Brine Pauper" could definitely hail from the Iron Isles - his artwork alone made me think "What is dead may never die." And if they get hurt, well, just entreat your PCs to a visit at the friendly white necromancer...troll-lady! Or take a brilliant idea: A dragon who uses his own body to carry premium cargo, essentially working as a one-reptile air mail system! Of course, an evil siren, a pirate haunted by strange, cursed (or are they?) magic items, a sahuagin-scoundrel, a kobold druid and his pet snake and a rogue morphoi are also in this book, providing us all in all with a gamut of interesting characters, cool ideas and plenty of hooks for them to add them to your campaign. Next up is a section that details the Island of Palau Kelaparan, where, as legends have it, the demon-lord Mechuiti entered the world and where his cannibal pygmies reign supreme with their demonic allies. Coming in the form of a sketchy description by areas, detailing crunchy environmental features and ideas by major locations as well as featuring sample traps, 3 fully statted sample NPCs as well as an encounter-table. The second Island included in the deal would be Umbrascara, which, as the name suggests, is close the realms of shadows and essentially has rather suffered from an influx of both shadow fey and intruders via the phenomenon called Darktide. Umbrascara feels more like a gazetteer than of a shortened adventure-location, making for an interesting contrast with the first island. What's also cool is that we get 3 different other ports of call in a gazetteer-style, almost player-friendly write-up. If you're like me and were a fan of the 3.5-setting, you may like that the upcoming SpirosBlaak-setting-update by Misfit Studios seems to be an official part of the Midgard world via this book - for there's a write-up here! Now that's cool! What I kind of missed was a similar nod to Freeport, but I still hope we'll get to see the Open Design-project some time and anchor the city of pirates in Midgard. Speaking of good write-ups - we also get 3 distinct different pirate bands, tables of driftgood, CR 4 mandrill-headed evil humanoids, Cr 1 rum gremlins and more importantly: Ship-tremplates! YES! Thank you so much! We get the amphibious, dragon turtle, fiendish, flying fish (short term fly over land! ), nautilus and arthropod and keel-sung ships and, what can I say, they ROCK and cover iconic things that should have been covered before. This is simply stellar! Two thumbs up for these! The new spells herein are also rather nice, though there are some fillers in here, like elemental surge, but we also get a spell to enhance a ship's hardness and generally, I don't have anything to complain about the new spells. Among the new magic items, we get one particular book that will never see use in my game and which I already didn't like in the design-process: The manual of island survival provides 10 different spells that help with survival, essentially taking away island survival problems and the investment of spells into it. However, we also get a sail of wonder and enchanted figureheads as well as an enchanted plumage. There also are 3 new traits. And then, the sourcebook becomes all-out awesome: Using rules analogues to the runes of the Northlands-supplement, we are introduced to 6 Aboleth Glyphs and 11 feats dealing with them, marrying content from sunken empires and northlands and expanding it. I LOVE it! We also get concise advice on Glyph creation, a three-step, rather complex and cool Thalassic creature-template and even the thalassic bloodline. Damn, I wished we got a whole sourcebook on this delightfully twisted topic! The pdf closes with a 2-page map of the Western Ocean. Editing and formatting are top-notch, I didn't notice any glitches. Layout is beautiful, full color and adheres to a 2-column standard. The pdf comes fully bookmarked and the full color and b/w-artworks adhere to the highest standard you could ask for. The characters and locations are awesome, the locations iconic, the Aboleth Glyph magic genius and the new islands rock. However, this pdf is not perfect, as much as I'd love to proclaim it to be. The islands get no maps (which is relevant if you don't intend to buy Journeys to the West), which is a minor bummer and the cool NPCs are all rather simple builds. Their fluff is great, but build-wise we don't get cool templated foes or complex adversaries. While the ship-templates are nice, I wished that there was perhaps a unique vehicle for the characters. The spells per se, while nice, didn't blow me out of the water. Well, at least the pdf didn't fall into the Spell/feat-glut-trap and instead focuses on useful, exciting content and good organization write-ups, which in my book help alleviate the minor issues I have with the pdf. I'll be honest with you: My first impulse was to rate this pdf at 4 stars. But the thing is - it does not deserve to be rated as only "good" - it is a stellar pdf, but one whose quality wavers slightly, like the waves on which it sails. Thus, my final verdict will clock in at 5 stars, but sans the seal of the approval. I'm excited to see this one up! I think the added islands, the pirate lords and other NPCs, plus the ship templates and aboleth glyphs really make this a sleeper hit. It's packed with a lot of fun stuff, and the thalassic template means you can create terrible minions of the sea who represent even deeper, darker powers-- which is what I like in my minions. Thanks for getting it posted! I should add, this is a bolus of supplementary material from Journeys to the West for use with it or another pirate/nautical exploration book. It's stand-alone, in that the material doesn't require the other texts, and I think all of the material is pretty fun and useful, but it really shines when used as a complement to Journeys. I'm quite fond of this one, especially the aboleth glyphs and the extra island writeups. Might make a very interesting surprise for the players if you were, say, playing a somewhat nautical adventure path. I was very happy with this book, too. Fun read. PaizoCon attendees who played "Into the Boiling Bay" will be pleased to see the Rum Gremlins. :) And the Behtu from KQ22 are in here! What pirate game doesn't need rum gremlins and demon apes? There is a terrific art preview for this book up on the artist's site. Seven images of seafaring adventurers, ships, and monsters! Huh. I don't remember seeing the squid figurehead in the book, but that's probably just me. I really like it! Guido has done a fantastic and piratey job with these! I was impressed by the aboleth glyphs. Also Marc Radle did a very solid job on the layout. I was impressed by the aboleth glyphs. Marc did a great job! I like the trade dress on it. The aboleth glyphs use the same mechanics as the Runes in Northlands, so you can build off of them or establish links, if you want. How easy would it be be use this with Skull & Shackles? It would fit in quite well, I think. The Shackles are filled with innumerable small islands, and many of the personalities contained herein would be a great addition to the Adventure Path. I think Liz said it perfectly! I don't see maps for Palau kelaparan and Umbrasca? or am i just missing them? Some are being worked on, so there should be an update at some point. And reviewed here, on DTRPG, submitted to Nerdtrek and sent to GMS magazine. Cheers! Glad you liked it! Ben did a good job of pulling all the material together, and he did the ship templates. I look forward to reading that review! Thanks. And yes, Ben and Christina rock! It's always a pleasure working with them! Thank you for the review, Endzeitgeist! Any word of progress on the maps? Yes, the ocean map is done. The extra island maps are in progress. Any word on if any are coming to the iPad app? Unlikely that the islands are going to appear on the iPad app. The developer is caught in other issues that are likely to delay the addition of new cities and islands until later in the year. Thanks for the reply. I hope he is OK. He's fine but lacking time to devote to the app for now. I hope things will smooth out later this year. Can we get a print copy anywhere else other than the kobold store? Not to my knowledge, no. Okay guess I'll be putting together a kobold order in the upcoming days!